We specialize in weaponry for competition and Law Enforcement applications. Long range and tactical carbine rifles, silhouette, and Varmint and hunting rifles in a range of calibers and configurations. Handguns for IPSC, ICORE and Bullseye. *= not a SAAMI spec chamber dimension... in these calibers, the most common for competitive shooters in my area, I have the reamers made specially with a very short throat. I then cut the throat separately. This allows you to tell me what length you want for your bullet seating depth. Our 338 SAC next to the 5.56. The 300gr SMK next to the 55gr FMJ. 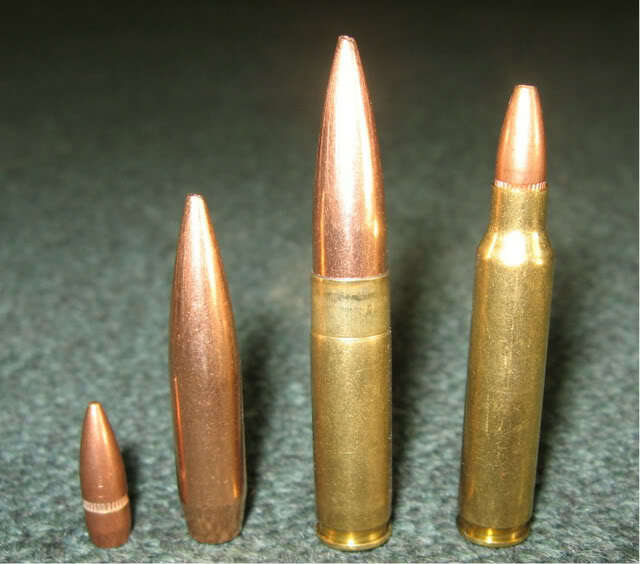 The .338 sac can deliver the 300gr at aver 1400 fps for maximum power, but ideally at @1000 for little to no muzzle blast. For comparison, the 223 makes a PF of 165- the 338 SAC makes a PF of 430! 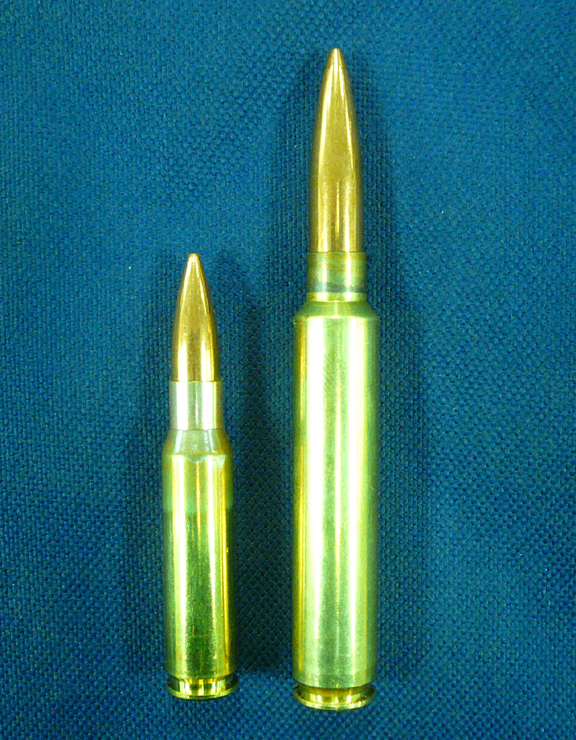 .308 next to the Giant .338 EDGE. The edge can propell a 300 grain bullet at 2880 FPS. 160 fps faster than the Lapua. More specific jobs, next page. Duracoat: A cold 2 part Epoxy gun finish that is as durable as its name applies- can be applied to any surface, and matched to any color or camo pattern you wish. Prices listed are for preparation and single color applciation. Additional colors add $30. Digital camo add $100. Wood Finishing, hand rubbed dutch oil finish in satin or gloss.